You are here: Home / Church Talk / church growth / Why do churches even DO rural ministry? Why do churches even DO rural ministry? The games we play say a lot about our values. 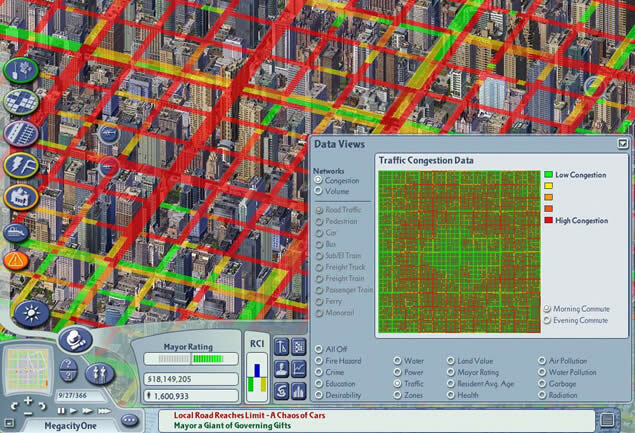 I recently read about a guy who created a megacity in the video game Sim City (this was Sim City 4, which came out about 12 years ago). This megacity had 107 million people living in it (by comparison, real-life Tokyo has 38 million). The way to “win” SimCity is to create a megapolis. The way to win at Cityville is to create a terrific urban city. My own current obsession Star Wars Commander creates a city-like expanse complete with turrets, shield generators, and AT-ATs. Heck, even a Farmville town by the upper levels looks like a city. The imagining of mega-cities had its most recent kick-off, in my experience, in the 1990s movie Demolition Man which had a huge city that spanned from Los Angeles to the southern tip of San Diego, named San Angeles. Don’t make fun, Yahoo’s Marissa Meyer has referenced it! If our media reflects life, then rural ministry is in for a rough few years. Today, 54 per cent of the world’s population lives in urban areas, a proportion that is expected to increase to 66 per cent by 2050. Projections show that urbanization combined with the overall growth of the world’s population could add another 2.5 billion people to urban populations by 2050, with close to 90 percent of the increase concentrated in Asia and Africa, according to a new United Nations report. In a way, these are good developments. Cities, though often the source of large problems, are simultaneously often the best places to combat large problems. For example, here’s a time-lapse of removing air pollution over 10 years thanks to courageous leaders in the cities. Some public problems are better dealt with at the city level as they often remain entrenched in rural communities. The number of rural high schools and sports that still have prayer at their football games or have baccalaureates in churches is amazing. But the numbers tell the tale and the question then is this: why do we even do rural ministry? Why do it if over the next 36 years, much fewer people will be outside of our urban centers? It seems much harder and less quick to take root like urban contexts with more people and resources. Drawing lessons from Sim City, my denomination of the United Methodist Church also tends to avoid church planting in rural contexts. For example, in the past five years, the UMC in Oklahoma has planted no less than three churches in Edmond, the stereotypically rich, white suburb of Oklahoma City. Two of them began the same year! While I have friends in these positions and I know their hearts are towards nothing but reaching people for Christ, it’s still striking that such emphasis is on this particular suburb. These three church plants follow two church plants in the late 1990s (one of which was to Chinese Americans, thankfully). So that’s five church plants in 20 years in one suburb in Oklahoma, with more on the way. While one might think that Edmond is desperate for churches, Greg Horton shows how that’s not necessarily the case. A recent video announcing that an Acts 29 church will be planting their fourth Oklahoma campus in Edmond said that Edmond has good churches, but that the city needs more. According to ChurchFinder.com, there are 89 churches in this “city” of 80,000. I have no idea if that number is correct, but I assumed the number was close to 100. Either way, what that city does not need is another church. The only churches that thrive in that area are churches that practice what David Fitch calls cannibalistic practices. They take members from other churches, and the most egregious offender has been LifeChurch.tv. We now have four large churches with active plants in and around the Edmond area…the idea that any church is going to plant in a wealthy, predominantly white area for the sake of evangelism is the worst sort of lie, especially when the numbers clearly indicate that they are growing, not through conversion growth, but through cannibalizing smaller, more traditional churches. We’ve talked before about this cannibalization process in “Vulture Churches” and “Franchise Churches” so click there to read more. In short, suburban folks need Jesus too, no doubt. But the church planting focus by many, many regions of Christianity (and Methodism) seems to build on the (relative) ease of sustainability in white suburban locations rather than rural or even inner-city areas. While we have rural fellowships and networks of smaller churches supporting one another, when it comes to church planting, I’d be shocked if any North American conference had more rural church plants than urban ones. Please show if I’m wrong in the comments. The City or the Garden? When we church-plant only in the places with abundant sunshine, we only grow a particular type of church suited for abundant sunshine. As we tend the garden of God’s church, we need places for those that grow in the brush, on the hills, places with more shade and different conditions. The truth is that we can’t neglect rural ministry or ministry to those folks who are not going to be easy to sustain a church plant from the get-go. Like Jesus’ parables of seeking out the lost sheep and leaving the 99, or searching the house for the lost coin, we also cannot neglect the population regions that matter numerically less than the ones with relative closeness to our hands. We are better together, both the temples and the tents. Indeed, this suburban evangelism strategy has implications for entire regions of America because it devalues even urban areas who are not as easy to church-plant in. Two years ago, I received a decent amount of ridicule/questions as I moved from Oklahoma, a bastion and strong United Methodist conference, to be in the mission field of Oregon. My new conference is the size of some districts in the South. And yet here is where an abundance of (different) resources and assets and seeds that I believe can revolutionize all of Christendom is to be found–I’m glad to be here seeking out new ways of being church in the midst of The None Zone. If the future is urban and the future population centers and imaginative games are found wrapped up in urban sprawl, then we need to be there too, but we cannot neglect our rural contexts or abandon more mission fields by selling properties to appease urban needs. As our creative new church planting strategies start to take root, my hope is they seek different contexts than the ones we’ve pursued before, not because they are easy, but because they are necessary for God’s garden to be a diverse garden and not a field of monoculture plants. I served 4 congregations in rural Iowa – at the same time – for a few years. They were each only 12 miles from each other. Very poor stewardship and none of them had critical mass or were able to “compete” with the independent churches. Some public problems are better dealt with at the city level as they often remain entrenched in rural communities. The number of rural high schools and sports that still have prayer at their football games or have baccalaureates in churches is amazing. This is a “public problem”? It’s breaking the law and continuing the problem of church/state violations. So yes, it is a public problem. these communities feed the world. In an age where we need to look at stewardship of planet Earth, people from rural areas have much to teach us. Rural areas are also places of great poverty in many instances. We are called to stand with the poor. Rich mission fields, indeed. Pun intended. I’m glad those were helpful, Jeannie. I put a lot of thought into how to frame it exactly how I meant it, and those seemed appropriate! LOVE your thoughts. I’ve always been one in favor of church planting, because we need to reach new people in new places. The problem, however, is sometimes we go to newISH PLACES and not reaching new PEOPLE. Churches tithe members of mother churches, but plant in the same demographic areas. Sometimes it works. In the future, I doubt it will. I’m also in favor of church consolidations, BUT with a caveat. I don’t think we should immediately go to the rural areas and assess fruitfulness. We have a lot of churches in the greater metro areas that are literally 5-10 minute drives from each other. They’re not all necessarily fruitful because it would seem they’re drawing the same people. Maybe we should bring our efforts together, save the districts and conferences money, and do ministry together. Instead of having 10 churches of 150-200 people, why not have 2 churches of 1000? That would create diversity as well as pool resources for ALL ministries. I say all of that to say, this may be going on in some rural areas. So we have to assess it from community to community. Sometimes metro areas may need closures/consolidations more than urban areas. NOW, I do think bigger churches can serve small churches that don’t have resources. We do need to have leadership in the local church, but if smaller churches need to outsource musicians, youth pastors, pastors (not necessarily a “preacher”), or preacher, then I think it is warranted. To me, sharing resources respectfully and not territoriality seems very connectional. I think this can be done in a way that is more of a “merger” as opposed to a “buyout” posing as a “merger,” if I may use business terms. Churches can keep their identity if they so wish, but have a larger church assist the with ministry resources. HOWEVER, it should also be clear that this is a ministry of the District/Conference THROUGH the larger church, so that there can be accountability (or something to that effect). Theologically, if we’re not careful, rural areas (those in poverty, with “old money,” and in between) will become “the least of these.” So, either way, we should care for them. They are people with spiritual needs as well. I’m afraid we may to have a “Mean Girls” situation where there is a cool and a not-so-cool table. Great thoughts, Keith! Thanks for them! Great ideas, but we church-plant/grow churches in rural areas with what money? Redistribute from the biggest churches on down? I’m not sure that “ecclesiastical communism” would be too popular with certain folks. Is Church Planting only for those under 35?